If there’s one thing our plant-based family loves, it’s HUMMUS. We go through mountains of hummus in our household, so I always make it myself to ensure that it contains organic, high quality ingredients (store-bought hummus often contains GMO canola or other unhealthy oils). A while back I started adding fresh rosemary to our hummus and although it tasted amazing, the texture wasn’t great. I could never seem to chop up the rosemary fine enough to avoid a gritty consistency. So when my latest dōTERRA order arrived last week containing ROSEMARY OIL, a light bulb went off in my head. 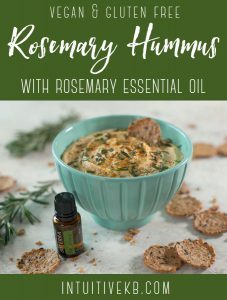 Adding rosemary oil instead of fresh rosemary to my hummus turned out even BETTER than I expected. It creates a beautiful flavor with an ultra smooth, buttery texture. I make my hummus using this food processor but you can also use a high speed blender like a Vitamix if you have one. I also add water instead of olive oil to lower the fat content, but feel free to use oil if you like. AN IMPORTANT NOTE: not all essential oils are equal so I highly recommend that you only use dōTERRA rosemary oil for this recipe. Many essential oils are not safe to ingest, so it is very important that you use caution when using essential oils internally. Chop the garlic by hand or drop it into the food processor while turned on to mince it quickly. Turn off the food processor and add the chick peas, tahini, lemon juice, salt and rosemary oil. Start with 2 drops of essential oil - you can always add more. Blend the ingredients in the food processor, adding a couple tablespoons of water at a time until you achieve your desired consistency. I usually add about half a cup of water; you can use olive oil in place of the water if you wish. Taste the hummus and add more salt and rosemary oil if you wish. Serve with crunchy crackers or veggies for a healthy and delicious vegan snack!